The object of this guide is to help train you to defeat all the Bosses in Boss Challenge Mode and in the Gauntlet without getting hit once. It will take some time, but if you follow these strategies, you will be able to defeat them quite easily and quickly. Boss strategies are the same for both the Original Quest and the Master Quest. The conditions are different, however. In the Master Quest Boss Challenge Mode and Gauntlet, Bosses do twice as much damage as in the Original Quest. In the Original Quest Gauntlet, you start off with five hearts as child Link. In the Master Quest Gauntlet, Link starts out with 3 hearts as child Link. You can gain up to two more heart containers as you go. In order to obtain the Boss Challenge Mode on each quest, you have to beat the Forest Temple and go back to the original timeline. Go to your bed and you will be given the option of resting, reliving past battles, or doing nothing. If you choose to relive past battles the first time, you will be given the option to fight against Gohma. 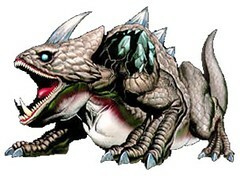 Once you fight and defeat Gohma, you will be able to fight the next boss in line, Dodongo, and so on until you reach Twinrova. Once you defeat Twinrova, the Gauntlet is unlocked. Each time you defeat a boss, the game will record how many times you have defeated him/her and your current record. The Gauntlet will record how many times you have beaten the entire Gauntlet and your current record. Original Quest: Bomb, Recovery Heart/Heart Container, Heart Container/Empty Bottle, Empty Bottle/ Big Quiver, Longshot, Blue potion, Heart container/Hover Boots. The format of the guide is as follows: name of boss with concept art, items needed to defeat boss, difficulty of the boss, my personal boss challenge records, strategy to defeat the boss, any notes, and a video showing the strategy in motion. At the end I will also put my personal records for the Gauntlets. -Please pardon the shaky cam quality and blurriness at some points in the videos. It was very difficult to do this without any 3DS capture software. -Even though some of the videos suggest the use of the 3DS gyroscopes, the videos themselves do not use this feature because of the impossibility of moving the 3DS around and keeping a steady picture quality. -Some videos suggest the use of outside resources such as swivel chairs and the 3DS speakers (or headphones). Give it a try and you will see that these are a genuine advantage. If you are not able to use a swivel chair, the next best thing is to just stand up and move as necessary (I sometimes do this during the first phase of Phantom Ganon). -Very Important: Your progress in both the Boss Challenge Mode and Gauntlet are not saved automatically. You have to go back to the main game and save your game there. You will also not be able to adjust your game options from either mode. 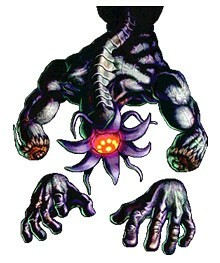 Strategy: Gohma is the first boss in the game. He is, not surprisingly, the easiest to defeat. When you enter his room, press the camera icon and look up at her. She will look at you and the game will introduce her. After the intro, immediately lock-on, take out your sling shot, and shoot at her when her eye turns red. She will fall to the ground stunned. Take out your sword, perform a continuous jump slash/slash combo (A and then B) until she becomes invulnerable again. She will backtrack and start climbing the pillars to the ceiling. Follow her and don’t lose the lock on her. When her eye turns red, hit her with a slingshot pellet, she will once again fall to the ground. Repeat the jump-slash/slash combo and that should be the end of her. If not, repeat the process once more. Note: There are patches of grass throughout the periphery o f the arena. You can get rupees, slingshot seeds, and recovery hearts from them. If you take too long to attack her in the ceiling, she will release some Gohma Larvae. Just kill them with your sword and wait for Gohma to drop to the ground. Hit her red eye with your slingshot and continue as detailed in the strategy. Strategy: As soon as the intro video is done, lock on to Dodongo. Step back if necessary and wait for him to start opening his mouth. Take out a bomb, move forward for momentum and throw it into his mouth. Step back a little and take out your sword. As soon as he falls stunned, jump-slash him and he will groan in pain. Step to the side next to the lava without touching it and he will start to roll forward (you can keep or lose the lock if you wish; I prefer to lose it and lock on when he stops). Once he stops and turns around, repeat the process twice more and you’re done. Note: If you are playing in the Gauntlet. There is a possibility that you may not have any bombs. If you don’t, use the Goron crops that are planted in the arena. 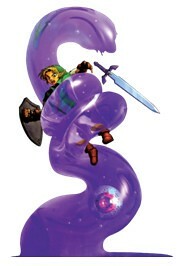 Phase I: Immediately run forward, lock-on to a tentacle, and side-run to either direction. Throw your boomerang which should take out one of the tentacles. Lock-on again and repeat the process until all three tentacles are down. Immediately run towards a wall, turn back, and lock-on to Barinade. Watch out for electricity from Barinade. Phase II: Keep side-running and evade the Biri (jellyfish) and electricity as necessary, while hugging the wall. When the Biri turn blue, run towards them and slash them with your sword (watch out for electricity from Barinade). You will have to repeat the process until all the Biri are gone. Phase III: Barinade will bring out new Biris and start following you around while spinning. You will have to lock on to Barinade and hit his body with your boomerang. The Biri will serve as a shield, so it may take a few tries. Be careful not to get hit by the Biris or electricity. Once Barinade is hit, the Biri will turn blue again and you will have to kill them all again. Repeat this process until all the Biri are dead. Watch out for electricity. 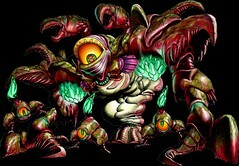 PhaseIV: Once they are all dead, Barinade will start spinning without any protection. Lock on to Barinade, and, when his “belly” is exposed, hit him with your boomerang to stun him. Take out your sword and immediately perform a jump-slash/slash/jump-slash combo (B then A then B). Repeat the stun and attack process until Barinade is dead. Watch out for electricity. Note: The framerate can take a big hit during this battle which will slow the game down and make it more difficult. You can prevent this by turning off the 3D. Watch out for electricity during all phases. You can get recovery hearts from the pots on the edge of the arena. Phase I: Go into the middle of the arena then turn back to the entrance. The arena will lock and you will face Phantom Ganon. As soon as the intro is done and you are able to move, go into the middle of the room and point your bow towards the painting in which Phantom went into. If he appears in that painting again, then great. If not, look for a another painting where he’s running towards you. He is always going to appear in two paintings at the same time. Meaning, one of those Phantoms is fake. If you’re lucky, both painting will be right next to each other. If this is so, point the bow towards the middle of both paintings and, when you figure out which Phantom is real (the one who starts to exit the painting instead of turning back), point at it and shoot it with your arrow. If the painting are not next to each other, then point your bow at one Phantom. If this Phantom is the real one, shoot it. The real Phantom will make horse hoof sounds as opposed to the fake Phantom which will not make any. For example, if the real Phantom is located to the right, he will sound louder through your right speaker. Immediately swivel your whole body towards that direction (hence the swivel chair). Once you locate him, point and shoot. If you are too late, he will shoot lightning towards you from above. You can avoid this by rolling towards the edges of the arena, very quickly. You have to repeat this process three times. Phase II: Once you hit him three times, Phantom Ganon will emerge from the painting sans horse and float around brandishing a spear. Lock-on to him and try to stand at “arms length” from him. He will shoot yellow energy balls at you which you will have to deflect with your sword. He may volley these energy balls back at you. If he does, you have to volley the ball back at him until it hits him. He will start to descend stunned. As soon as you see the energy ball hit him, take out your sword and jump-slash at him (a button) then start slashing at him with the b button until he starts floating again. Repeat the process until he is dead. Note: In Phase I, aiming with the gyroscope makes the fight far easier than aiming with the C-Pad because it is much faster and accurate. The video was shot using the C-Pad aiming because it was not possible to shoot it with the gyroscope unless I had some 3DS capture software. In Phase II, if you stand too far from him, he may lunge at you with his spear. He will telegraph this move by emitting different colored particles that make a different sound. Immediately side-step or side-jump to avoid it. Credit to @Secret_Tunnel for correcting my misconception about the Phantom sounds. Items: Red Tunic, Megaton Hammer, speakers. Step 1: Once the intro is done, Volvagia will emerge from one of the lava pits; flames will sprout from the hole he will emerge from. Immediately go up to him and hit him with the Megaton Hammer, lock on to him, and step back a bit to avoid getting hit by his head. He will reel back in pain, swing his head around, and fall stunned. Get close to him and jump-slash him. He go into the lava pit again. Step 2: He will emerge from one a lava pit and start to fly around. Immediately lock on to him and side-run. He will start to shoot fire from his mouth, but since you will be side-running, you will be fine. If you feel that you are too close to his fire, side-jump while running. You can also switch sides in between fire breaths, if you feel you need to. Be careful not to touch his body or he will hurt you. Eventually he will fly into one of the lava pits. He will then emerge from one of the lava pits; he may fake you out once or twice making flames emerge from the wrong lava pit. You have to stand in an area of the arena where you can see every lava pit. You also have to slightly hit the C-Pad because, if the game doesn’t detect movement, the camera will swing around and face you, instead of the arena. Make sure you are close to the lava pit that Volvagia emerges from so that you can hit him quickly. Once he emerges, repeat Step 1. Step 3: Once he goes back into the lava pit, he will emerge again. But this time, he will fly straight up until he escapes from your view. He will fly around the ceiling and start dropping boulders on the arena. You can see where these boulders will land by looking at the shadow on the arena. Run around to evade them. When you hear that the sound of the boulder crashes becomes different, it means that the boulders will start to fall on one particular lava pit. This is the lava pit that Volvagia will fly into. Stay away from it because the boulders will hurt you and so will their debris. 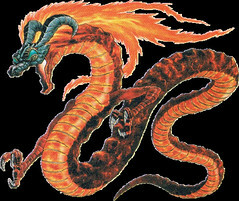 Volvagia will then emerge from one of the lava pits; he may fake you out once or twice making flames emerge from the wrong lava pit. You have to stand in an area of the arena where you can see every lava pit. You also have to slightly hit the C-Pad because, if the game doesn’t detect movement, the camera will swing around and face you, instead of the arena. Make sure you are close to the lava pit that Volvagia emerges from so that you can hit him quickly. Once he emerges, repeat Step 1. Note: The process of the steps is the following: Step 1, Step 2, Step 1, Step 3, Step 1, Step 2, etc., until you defeat him. Always mind your surroundings. Make sure you don’t fall of the edge of the arena. If you do fall off the arena, immediately climb up the walls of the area (they are climbable even though they don’t look it). The lava pits can harm you if you stay on them too long, but if you are just walking over them or side-running quickly, you will be fine. Strategy: Jump onto one of the pillars to start the intro. Once the intro is done, jump back to the periphery of the arena, where you will remain for the rest of the fight. Immediately lock-on to Morpha (the red ball thing). Wait for him to form a tentacle and emerge from the water. Try to stand so that the tentacle is extending towards you and shoot your hookshot (this is the easiest way to hit him with your hookshot). Once you reel him in, immediately hit him with your sword; you will usually get one hit in. Repeat the process until you hit him 12 times to defeat him. 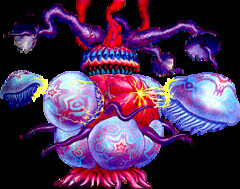 After you hit him twice, he will start to generate two tentacles, but will only emerge from one. You have to be careful not to get caught by the second tentacle while you are trying to hook Morpha in the first. Note: Always mind you surroundings. Make sure not to get hit by the spikes that surround the periphery of the arena. Once two tentacles start to appear, pay careful attention to the speakers. If you hear bubbling coming from either side while you are trying to hook Morpha, run away. If you don’t, the second tentacle will catch you and do serious damage before throwing you towards the spikes. If you fall in the water you cannot be grabbed by the tentacles but they, and Morpha, can still hurt you. Strategy: If you don’t know how to fight him, Bongo Bongo will destroy you very quickly. However, if you know how to attack him, he will have a hard time laying a hand on you (no pun intended). Jump into the hole and let the intro run. Turn on the lens of truth. Afterwards, run towards the end of the arena, position yourself in line with the eye markings on the floor, and face Bongo Bongo. Bongo Bong has four sets of attacks: a clap, a sidesweep, a punch, and a grab. The first 3 will hurt you once while the last one will squeeze out your energy. If he uses the clap, return to your original position and wait for him to attack again. If he attacks any other way, roll towards the remaining hand (not directly forward or you may get hit by the attacking hand; the sidesweep may require two rolls). After rolling, immediately take out your bow, point with the gyroscope, and shoot the non-attacking hand. Once it is stunned, immediately aim towards the second hand which should be returning to its resting position. After you have it in your sights, shoot. Now aim, for Bongo Bongo’s eye with the gyroscope and shoot. Take out your sword. Bongo Bongo will fall stunned to the arena. Immediately jump-slash, slash, jump-slash, etc. (a,b,a,b, etc.) until he regains his composure. Now repeat the whole process again until he is dead. Note: Aiming with the gyroscope makes the fight far easier than aiming with the C-Pad because it is much faster and accurate. The video was shot using the C-Pad aiming because it was not possible to shoot it with the gyroscope unless I had some 3DS capture software. Whenever you hit Bongo Bongo’s eyes or hand, he will drop arrows or magic containers. Items: Mirror Shield, Sword, Speakers. Phase I: Climb up the wall onto the arena and wait for the intro to finish. Once it finishes, walk around the arena until you hear that one of the sisters is about to shoot. Face that sister without locking on and aim your mirror shield at her. Once she hits you mirror shield with her spell, hit the opposing sister with the spell that is reflected off your shield. You have to hit the sisters a combined number of four times. Afterwards, the sisters will merge onto Twinrova. Phase II: Twinrova is actually easier than Koume and Kotake. Lock-on to her immediately and go to the middle of the arena, waiting with your shield held out. Wait for her to either shoot a stream of fire or ice towards you. It will be absorbed by your mirror shield and it will start glowing and making an alarm sound; it’ll grow louder the more shots of the same element you absorb. You need to capture three shots of the same element (three fire shots or three ice shots). If she fires a stream of the element you don’t have on your shield (for example, you have fire and she shoots ice), evade the shot by side-running to the edge of the arena. The arena will be covered in either fire or ice depending on the shot you avoided. Once the fire or ice disappears from the arena, go back to the center of the arena, wait for Twinrova to shoot again, and absorb or evade as necessary. Once you absorb an element three times, the shield will release a stream of that same element towards Twinrova. 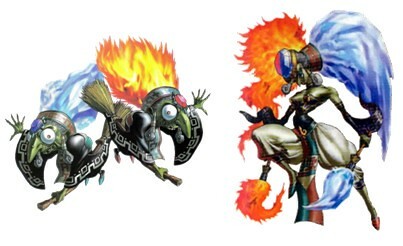 While still locked-on, run towards Twinrova as you release the stream of fire or ice so that it will hit her. Once you hit her, release the lock and run towards Twinrova who has fallen on one of the four pillars surrounding the arena. Take out your sword and you will automatically jump towards her. Immediately jump-slash her (this time by pressing “b” because you will be in mid-jump and b won’t work) and keep slashing at her with your sword (jump then, b, then b,b,b,b, etc.). When she becomes invulnerable again, jump back towards the arena, lock-on to her and repeat Phase II until she is dead. Note: If you fall off the arena, you can climb back on the climbable edges of the arena. Time the climb so that neither witch is about to shoot. Also, they can shoot you at the bottom of the arena too. Your Bongo Bongo strategy made the Guantlet CAKE. Oh, and I didn't realize this until attempting the Gauntlet, but I'm pretty sure only the real Phantom Ganon will make horse-step sounds, so if you listen you can tell which one is real. @Secret_Tunnel I checked it out and you are right. I have corrected the guide and I gave you credit for the sound. Although I don't own Ocarina of Time 3D yet (I know, I know... hey, I do plan to pick up it up later), I have to say I appreciate this guide, Sir Master Sephiroth, and sharing your strategies with the many OoT 3D players out there. @roykoopa64 My pleasure. I hope it can help many people out there who are having trouble with the gauntlet like I was at the beginning. By the way, I just noticed that I never put in my Original Quest Record times and fixed it. I really need to stop writing these articles in the wee hours of the morning. Edit: I just redid Bongo Bongo and shaved my original time of 00:59.23 by a little over 6 seconds. Now it's 00:53.13. Nice guide, man! Very elaborate and thorough. You should definitely pimp it out at the various sites. GoNintendo just published my guide! Nice job on the guide, and the publication! I've bookmarked this thread for later, I just picked up the game and a 3DS. Woo! Thanks! Welcome to the club. You're going to have an awesome time with he 3DS and OOT3D. The video was shot using the C-Pad aiming because it was not possible to shoot it with the gyroscope unless I had some 3DS capture software. Seriously. 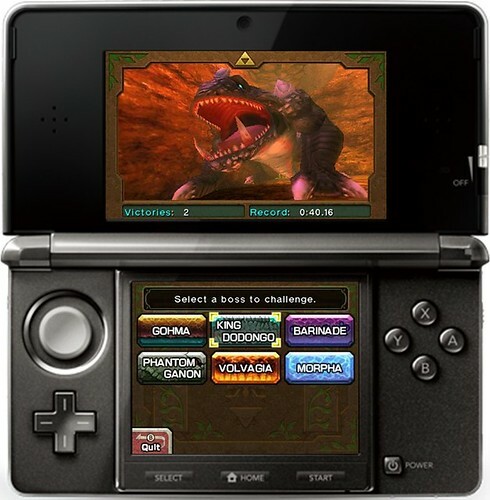 Nintendo needs to release a capture app for 3DS. It's almost imperative. @Shadowlink I agree. Even if it's a few hundred bucks. It''ll make our reviews a whole lot more interesting. Awesome! You are indeed " sir master " .... Anyway this is a well written strategy guide. I will definitely use it later once I get a chance to play. 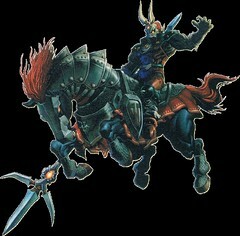 I love Ocarina of Time and I'm sure I'll enjoy playing it in 3D. Guillaume is seething right now. EDIT: AUGH. I forgot this doesn't autosave! I ragequit after failing the Gauntlet and lost all my times! Edit 2: 1:01.40 MUCH better. But it can be improved . Edit 3: 00:41.93 I think that's enough for tonight. But Negative World seems to be accepted on GoNintendo more often these days. That's pretty cool. It'll inspire people to write more stuff. I figured it was that. @Shadowlink Awesome times! I hate that fight; it's so tedious. Trick that I learned- If you can trap Morpha in the corner you can repeatedly wail on it instead of having it escape back into the water. Trick is to use your hookshot *multiple times* whilst moving back towards the corner. That will continuously drag Morpha to the corner you need it to be at. Then quickly circle around it and go nuts.